Deciding to learn how to play guitar and taking that initial plunge is one of the best feelings ever. You are new, fully ready to start with the first lesson, but you're missing one important thing - a guitar. You're in the right place. 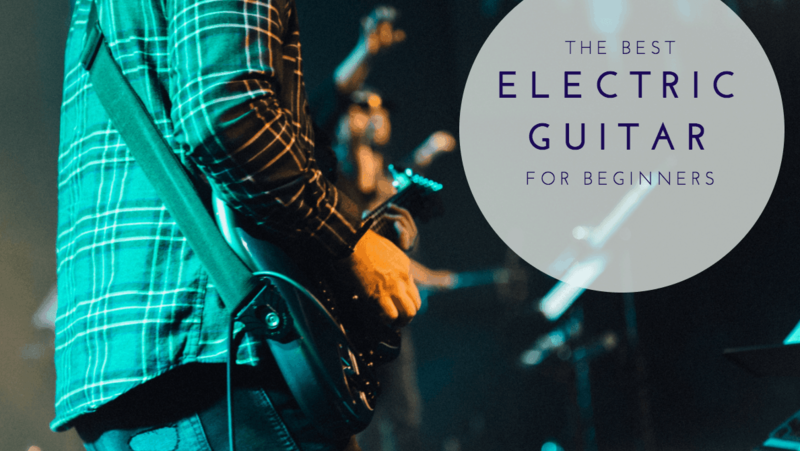 Today we are going to show you the best electric guitars for beginners and talk about what to look for in your first guitar. **There is more information below, but feel free to check out the Amazon customer reviews for a second opinion. Before we show you the axes we have picked for this occasion, we have to touch upon some pretty important issues that you need to figure out. Planning is the most important step of the process, no matter if you're buying your 1st or 21st guitar. When you're shopping for guitars, there is one universal rule. You should always buy the best guitar you can afford. At least that's what they say. This is where budget comes into play. Whether you have couple of hundred or couple of thousand dollars to spend will depend on your current situation. However, no matter what your budget is, you will have options. Beginners are usually instructed to go for an entry level guitar. Reasons for this being that you will use that instrument to learn both technique and how the guitar itself works. One of the benefits of going for an entry level model is low commitment. If you decide that guitar is simply not something you want to do, your loss will be minimal. On a similar note, as a beginner, you won't be able to recognize the difference in tone quality, tonewood selection and other factors that differentiate electric guitars. We are going to suggest humbuckers for one pretty simple reason. Single coil pickups, even the most expensive ones, have a side effect that comes in form of a coil buzz. It's a type of background noise you will hear whenever your guitar is plugged into an amp. Cheaper pickups only amplify this problem. Because of that, going with even the most basic humbuckers is always a better choice. The nature of a humbucker eliminates coil buzz altogether, plus you get a much beefier and versatile tone. A decent entry level humbucker guitar will be something you can use even when you advance as a player. Starter Kit or Just a Guitar? Starter kits or packs offer the best bang for the buck. Aside from the fact that you get everything you need right away, they solve the issue of choosing the amp and every other piece of gear. On the other hand, the quality of amps that come with these packs are acceptable at best. In the end, it all comes down to what you want. If you plan on building your rig for a long term use, buying everything piece by piece is a better option. However, if you want to start tomorrow, starter packs might be your best bet. Here's one factor that many guitar players, tutors and teachers like to ignore. Specs of a guitar are important, there's no doubt about that. However, whether you like it or not plays a huge role in those initial stages. Being excited about your guitar is what will keep you coming back. If you choose a model that you don't find attractive but one which brings good specs, you are setting yourself up for problems down the road. Naturally, the best solution is to find a model that is both great in terms of performance, and one you find attractive. Squire has been the patron saint of newbies for decades now. If you know someone who has been playing guitar for 10 or so years, chances are they started out on a guitar just like this one. Squier is also the only Fender licensed brand out there, making them the prime source of low budget Stratocasters. Bang for the buck, Squier Affinity Strat is near the very top of the ladder. Even though it is a single coil guitar, the performance is satisfactory to say the least. If you are a Strat fan and you want a decent copy as your first electric guitar, this is it. Plus you get the amp and all the rest of the goodies in this pack. Next, comes the arch nemesis of the Stratocaster - a Les Paul. Just like the Squier, this Les Paul is produced by Epiphone, the only licensed brand for this side of the isle. Fitted with decent humbuckers, this guitar packs one pretty wholesome tone. One great thing about Epiphone's Les Paul we're looking at here is its versatility. If you want to play blues, you can. On the other hand, if you want to rock a sick metal riff, you can do that as well. 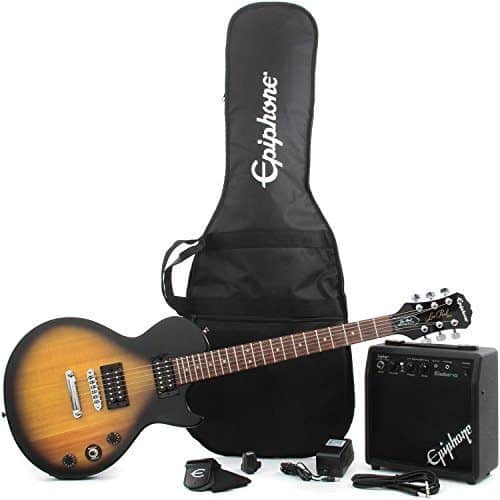 Epiphone's starter pack comes with the guitar, Epiphones practice amp and several other accessories. What follows is an Ibanez starter model. Built for those who aspire to shred, this guitar is actually quite decent for the money. It doesn't come with an amp or anything similar, but it is a great foundation for a custom built rig. With great humbuckers and a fast neck, you will find it pretty easy to learn on and play. Speaking of metal guitars, here's one of the more recent models. Schecter's SGR division has built a true metal machine with a comfortable, curved body and a set of hot humbuckers to boot. Simple but powerful, SGR's C-1 is truly one of the best beginner guitars you can get at the moment. Last but not least we have a solution for those on a really tight budget. Best Choice isn't really a company with any kind of significant reputation, but this starter kit offers everything that is necessary. The guitar is decent enough, and the amp works. If you need your gear to be branded, this is the wrong pack for you. However, if you just need a budget solution that works, you won't find a better deal than this. At the end of the day, your first guitar is going to be the one you will remember forever. Making an educated choice is essential. Hopefully we've armed with enough information to just that. Guitars listed above are by far some of the best electric guitars for beginners, so you should definitely find something that fits your needs.